A year ago, Disney duped us all by reproducing a film they had already made twelve years prior and passing it off as something new. That new project was The Good Dinosaur, the old was Brother Bear. Teaming up with Pixar gave Good Dinosaur unparalleled animation and stunning visuals, but the story is basically the exact same as Brother Bear, with a few animals switched around just to keep it interesting. How did they pull this off, you ask? Well, I’m not actually sure. More users on IMDb have rated Brother Bear than Good Dinosaur, giving the films similar ratings, ironically, so it’s not like no one saw the original. Perhaps enough time passed to forgive any similarities or audiences have become so used to Disney films having the same basic plots that it just doesn’t matter any more. In the great frozen north, humans live in concert with nature, the spirits of the Earth, and the beautiful Northern Lights. An Inuit village there survives by understanding their place in the world and the role of each of their members. Kenai is told that his path to fulfillment will be through love, but when his elder brother is killed by the bear that Kenai himself provoked, all he feels is hate. 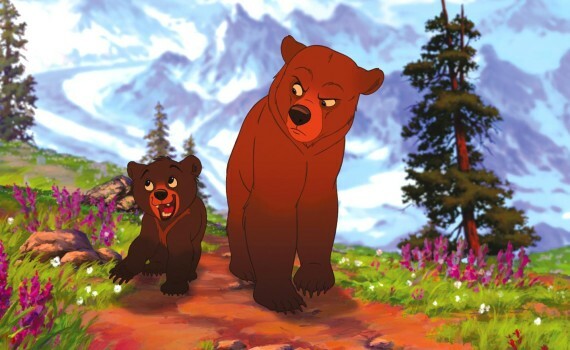 Killing the bear in revenge, Kenai is taught a lesson by the spirits in order to open his eyes to the ways of nature. He is turned into a bear, forced to see things from a new perspective, and tasked with using the help of animals in order to return to his human form. Teaming up with a small bear named Koda and two silly moose, Kenai must learn quickly to adapt to his new body & environment. If you saw Good Dinosaur, this is going to sound familiar: an unfortunate death causes a young guy to angrily hunt down an animal, which leads him away from home where he’ll then have to rely upon that animal to help get him back. Oh, and there’s a mountain he’s trying to reach that marks the way home, he meets funny creatures along the way, and his ultimate goal is to leave a mark of the wall of a communal space to show that he’s grown up. Basically, it’s the same story with humans/bears instead of dinosaurs/humans. The only difference is that Brother Bear attempted to have music, even hiring Phil Collins, since that pairing worked so well with Tarzan four years earlier. Well, it didn’t work this time; the music sucked. And it doesn’t have the incredible animation of new Disney, so what you’re left with is a film akin to Prince of Egypt instead of Inside Out, but a enjoyable kid’s movie nonetheless.